It has been ten years since I first turned over the final page in Madeleine L’Engle’s A Wrinkle in Time, a challenging science fiction children’s novel dealing with inter-dimensional travel, complex scientific ideas, and the ultimate power of love. When I first put it down, I wasn’t quite sure exactly how the plot in the novel had worked, but I was mesmerized. I felt as though I too had been transported through multiple dimensions and had emerged a different person, which was a rather dramatic sentiment for an eight year-old boy, but a satisfying one nonetheless. Rarely since then have I encountered, in the science fiction genre, an experience that could mimic the boyish wonder that L’Engle had evoked from myself. Today, however, I’m proud to say that Christopher Nolan’s film Interstellar, which released in theaters Nov. 7, is such an engrossing and visceral film, that as the credits rolled, I was as giddy as an eight year-old boy, deep with wonder about the universe and my place in it. Similar to Inception, a previous Nolan film which released in 2010, Interstellar has its fair share of structural challenges, and I myself required two viewings to feel completely comfortable with its intricacies. To go further than scraping the surface of the story in this review would do a serious injustice to those who haven’t seen it yet, and thus I’ll attempt to tread lightly. As any viewer will see, however, the brilliance of the film goes much further than simply the plot. The plot in question tells of a future world in which a mysterious blight and heavy dust storms have destroyed the world’s crop production. Essentially, Earth is no longer a planet that can be inhabited by humans. In archetypal fashion, the task of finding humanity a new home falls largely on the plate of one man, Cooper, portrayed by Matthew McConaughey. Cooper, a former pilot, must leave his family behind and embark on an intergalactic mission to survey several planets and find one that can either save the humans of Earth, or place a new colony of embryos to ensure humanity’s survival, provided that the former plan is unsuccessful. In many ways, this is McConaughey’s film. The ongoing “McConaissance,” or the recent success of McConaughey in serious roles, now has another shining addition to its list, with the brilliance with which McConaughey depicts both Cooper’s flair for adventure and burning desire to return to his loving children. The cast of characters embarking on the mission include a number of scientists, one of which is portrayed by Anne Hathaway in quite an understated, but nonetheless effective, performance. The most compelling supporting characters in the astronaut crew, however, are not the humans but two robots, TARS and CASE, who don’t simply provide comic relief but serve as the most endearing robotic sidekicks I’ve come across in film since C-3PO and R2D2 of the original Star Wars trilogy. Michael Caine, a staple of Nolan’s films, steps in to portray an aging professor who sets the plan in motion. Yet, as the crew embarks on a journey to several vastly different planets, the astronauts are anything but prepared for the enormous difficulties they are bound to face. 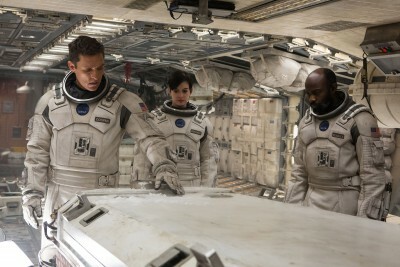 What is pleasing about Interstellar is Nolan’s resistance to using action as the main driving point of the plot. Indeed, the most compelling sequence in the film is one in which the crew desperately tries to dock its vessel to a larger station in space. This, in turn, is a remarkable aspect of the film: amongst the many science fiction efforts that are released yearly, the film doesn’t need to rely on explosions or fight sequences to raise excitement in the viewer. Yet, the ultimate mastery in Interstellar lies in Nolan’s ability to capture a poignant human story amidst all the scientific discussion that the film offers. At the base of all the complex ideas lies the everyday man in Cooper, whose love for his family pushes him forward as much as it holds him back. In this sense, the film is not just enthralling but deeply moving, and the greatest praise I can offer is that the late Madeline L’Engle, author of A Wrinkle in Time, would likely be very proud. Interstellar is nothing else if not an instant classic.